As a small business owner you are always looking for a way to get a leg up on the competition. And you know that search engine optimization will help your website get found by potential customers. So, our SEO tips today look at two search query parameters that can help you understand some things about the health of your web site -- and the sites of your competitors. Search engines like Google and Bing are constantly combing the Internet for new web sites and content to add to their database. When they find it they index it. This is the first step in determining what content to display when people search for something on the web. So, when potential customers search for what it is you sell, if Google has indexed your site and thinks your content is relevant it will display your information in the search query results. But first they have to find you. Is your site being indexed? How do you know? We have a short video that explains this in more detail, but all you have to do is type in "site:" followed by a URL such as your domain name or that of a competitor. The results will show you all the pages that have been indexed. Try it for your web site. Is something missing or -- gulp -- is nothing showing up? That means your site is partially or completely hidden from the search engines -- and that won't change until you do something about it. Back links (links on another site that lead back to your site) are a great strategy for enhancing the credibility of a web site and improving SEO. High-quality back links are also notoriously difficult to acquire. 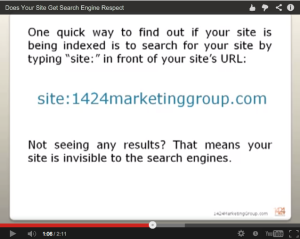 Wouldn't it be great if you could see the back links for your competitors' web sites? Well, sit back and relax because you just hit the motherlode. Type in "link:" followed by the URL of a competitor. What will display are all the sites that have links pointing back to that web property. So, now you have a list of sites you potentially want to acquire a back link from. Doesn't get much easier than that, huh? If you want to learn more about these search query parameters, check out this blog post I ran across recently. And, of course, we're always here to help out, too.